Forty-five years ago, the Clean Water Act was passed in the United States (US), building on earlier federal legislation and extending stringent safeguards to the nation’s water supply. Just 2 years after the formation of the Environmental Protection Agency (EPA) in 1970 and 6 years before the Great Lakes Water Quality Agreement in 1978, it signaled a historic milestone for water protection in the US and helped mark the 1970s as a defining era for environmental health and advocacy. In the years that followed, further legislation, mounting regulations, advances in technology, and environmental activism all combined to generate innovation and paradigm shifts aimed at protecting water resources from the evergrowing threats posed, paradoxically, by the successes of social progress and economic growth. While the gains have been steady, they have not been as swift or as broad as some would like. The reasons have a complexity all of their own, as do most public health and safety decisions that involve a myriad of stakeholders. For water treatment utilities throughout the country, decisions fundamentally come down to whether or not it is worth disrupting the status quo. Adopting new technologies or processes often involves changing something that’s currently working fine, and when the safety of citizens is a concern, it’s not surprising that there is a reticence to embrace anything less than the tried-and-true. In this approach, a conservative philosophy becomes one of the guiding principles. Resources are also a key consideration. The EPA estimates that US$271 billion will be required for infrastructure upgrades over the next 25 years – an average of nearly $20 million per treatment facility. And while some federal funding is available, according to the US Conference of Mayors, 95 percent of infrastructure expenditure is done at the local level. Most utilities are already working with limited budgets, so taking on new technologies that require additional financing outside of the capital plan often requires significant rate increases to bridge the gap. Understandably, utilities are neither eager to saddle their constituents with the added financial burden nor manage the accompanying public opinion fallout. Nonetheless, the sector understands all too well the need to continue moving forward. Over the next 15 years, 56 million new customers will be added to the 274 million currently using centralized water and wastewater services (versus private septic services). That increase alone will require significant infrastructure upgrades. But perhaps one of the biggest challenges utilities face is environmental. According to the EPA, there are more than 160 dead zones – hypoxic areas caused by nutrient pollution and other factors – throughout the US. Nutrient pollution affects water quality in approximately 161,000 kilometers of rivers and streams, 1 million hectares of lakes, reservoirs and ponds, and more than 2,072 square kilometers of bays and estuaries. And the problem is global – algae blooms occur regularly around the world, giving rise to an estimated 400 dead zones worldwide. In the wake of the Toledo, Ohio, water crisis, during which more than 400,000 citizens faced a 2-day ban on tap water due to toxic algae, public concern surrounding nutrient pollution escalated nationwide in addition to scrutiny of water supply and treatment along with it, regardless of the source – even though EPA and state analyses indicate that municipal treatment plant discharges account for only 10 percent to 30 percent of all water impairment. But because point source discharges are far easier to measure than nonpoint sources such as agricultural runoff, there has been more rigorous regulation of the former. Nutrient criteria are slowly but surely becoming the norm: in 1998, 12 states had established some form of nutrient criteria, with just four states at Level 3 or higher. By 2008, six more states had introduced nutrient criteria, and 24 states now regulate nutrient limits, seven at Level 3 or higher. 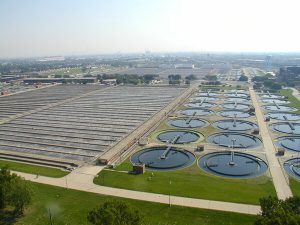 Between rising public concerns for environmental health and continuing regulatory pressure, treatment facilities have begun to think creatively, creating a movement captured by the Utility of the Future (UOTF) model, conceived jointly by National Association of Clean Water Agencies (NACWA), Water Environment Federation (WEF), and Water Environment & Research Foundation (WERF). Enlightened agencies are redefining their purpose and rationale in a shift of thinking from wastewater treatment plant to resource recovery center. Replacing the limited perspective of a facility that simply treats sewage or wastewater is a broader, more holistic mandate in which utilities become a source of valuable resources – nutrients, energy, water – recovered from the raw material inputs they treat. The shift is revolutionary and invigorating. It opens up pathways to innovation and reinforces the tremendous social value that many take for granted. In some ways, the Utility of the Future concept may even be a bit of a misnomer, as many US facilities have already been operating along that trajectory. An early mover over the last decade, the public water utility Clean Water Services in Oregon has saved tens of millions of dollars in costs and achieved 100-percent permit compliance through innovative productivity measures such as a temperature water quality trading program and nutrient recovery. DC Water’s Clean Rivers, Green District Partnership with Washington, DC, uses green infrastructure to prevent pollution from coming into contact with rainwater. The Milwaukee Metropolitan Sewerage District has implemented efforts such as green infrastructure, watershed-based permitting, and effluent trading. It also uses renewable energy sources to meet 100 percent of its energy needs, all reducing its carbon footprint by 90 percent. Global Water Resources in Arizona uses advanced metering infrastructure and cloudbased data analytics to reduce water losses, offering real-time monitoring of water use. These innovators, and many others like them, stand as evidence-based role models for others to emulate. Perhaps no utility demonstrates the tremendous power of embracing UOTF principles better than the Metropolitan Water Reclamation District of Greater Chicago (MWRD). The largest treatment facility in the world, the MWRD’s Stickney plant treats up to 5.45 billion liters of water each day, which discharges into the Chicago Sanitary and Ship Canal, ultimately feeding into the Mississippi River watershed and making its way to the Gulf of Mexico. Being the largest treatment plant in the world also makes it the state of Illinois’ single largest source of phosphorous making its way into the watershed. By some estimates, Illinois is the biggest contributor of phosphorus and nitrogen pollution to the Gulf, with state wastewater treatment plants accounting for half of the phosphorus reaching the Mississippi, according to one task force. Years before limits were legally required, the District voluntarily adopted a discharge limit of 1 milligram per liter (mg/L), and often its discharge concentrations are half that amount. The nutrient recovery system it chose would have to adapt to existing operations, but – more importantly – it would have to satisfy the District’s goals of having a long-term beneficial impact on the watershed. Ostara’s Pearl® nutrient recovery technology was flexible enough to satisfy these ambitious aims and also be cost effective enough to be feasible – at $31 million, the cost was only a fraction of the $700 million that regulatory agencies originally estimated the clean-up costs would be. Ultimately, the solution will reduce phosphorus discharges by up to 30 percent, significantly reduce biosolids production, cut back on chemical inputs, and produce up to nearly 7,000 metric tons of environmentally sound Crystal Green® fertilizer each year, creating a stream of revenue through a licensing agreement with Ostara that will eventually generate up to $3 million annually. MWRD’s award-winning business model incorporates all of the characteristics that epitomize a true UOTF: beneficial biosolids use, community partnering and engagement, energy efficiency, energy generation, nutrient and materials recovery, water reuse, and watershed stewardship. More importantly, the District serves as a lesson and an example of the importance of engagement and collaboration within the broader community. Our thinking cannot afford to be siloed. We are all interconnected and acknowledging that this interdependence is critical to achieving global environmental health. Conflict keeps us in those silos, but engagement opens up paths to innovation. Ostara’s unique dual perspective – water treatment and fertilizer production – really helps drive home the notion of this interconnectedness. The way we treat and manage one resource affects the way we treat and manage others. As a partner in MWRD’s strategy, Ostara’s job was to provide the best solution possible to support the District’s global vision. As with truly great partnerships, all collaborators were pushed to expand their own thinking, to see beyond limits, and create something that hadn’t yet been achieved – and, in effect, to also become a Utility of the Future. In the words of MWRD’s David St. Pierre: “In terms of a worldwide paradigm, we’re going to have to start thinking like this on a grander scale and recover these resources where they’re at and not necessarily in traditional ways.” We couldn’t agree more. 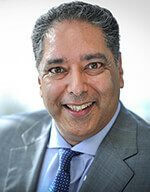 Dan Parmar is president and chief executive officer of Ostara Nutrient Recovery Technologies, headquartered in Vancouver, British Columbia, Canada.